Whew! After all those red beets and red beans, I’m ready for a little green food, aren’t you? Spring has just about sprung where I live and I like to step up the green leafy vegetables around this time of year. I eat green leafies year-round. Love kale, collards, turnip greens and watercress among others. But this time of year calls for some spring cleaning liver-wise and blood-wise. By that I mean it is time to ingest some foods that will help you clean up any gunk you collected last winter. Wow! Over 10,000? That’s right. And there’s no way you are going to know all of them and get them through some kind of vitamin pill. What I’m here to tell you about today is that eating dark leafy greens every day will give your system a cleansing and besides, they are deeeelicious! Now I’m not talking about lettuce. I know for some people “greens” means lettuce. No, I’m talking about the dark leafy ones. If you aren’t used to dark leafy greens I would suggest starting with the sweeter tasting ones like kale or collard greens. If you want to be more adventurous, get into the slightly bitter tasting ones such as watercress, turnip greens and rapini. Or, for a whole hog springtime cleanse-o-rama, get yourself some spring season young dandelion greens! You can steam ’em, you can boil ’em, you can do all sorts of things to ’em. My favorite way to prepare the more bitter variety is to saute them with olive oil and garlic. Mama Mia! Start with washed greens, olive oil, garlic and sea salt. These happen to be called “rapini” greens. Cut the greens, heat up some oil, add some garlic and then add the greens and sea salt. Saute these until they are all shiny and slightly wilted but still retain their bright green color. 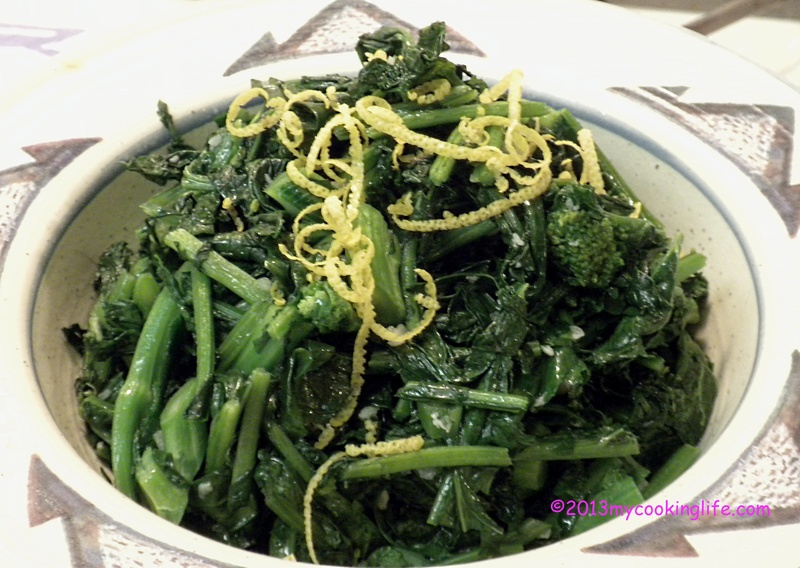 I like a little lemon zest with my garlic and greens . . uh . . .I mean greens and garlic! Combine eating those greens with some other light grain and vegetable based meals, cut back or eliminate animal foods, and watch the caffeine and alcohol and you’ll be clean and green in no time! 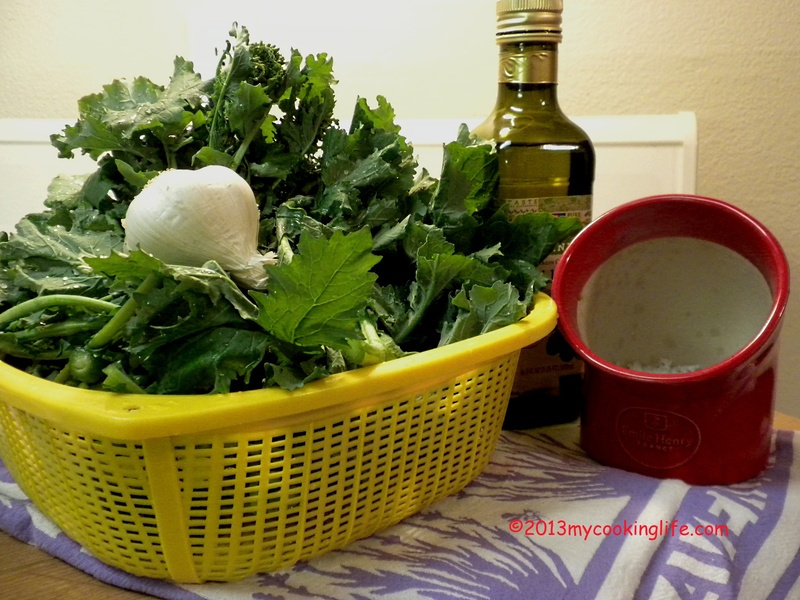 This entry was posted in Cooking, Recipes, Vegetables and tagged cleansing foods, collard greens, dandelion greens, dark leafy greens, kale, mustard greens, phytonutrients, rapini, turnip greens by mycookinglifebypatty. Bookmark the permalink. They are definitely a tradition in the south, aren’t they?